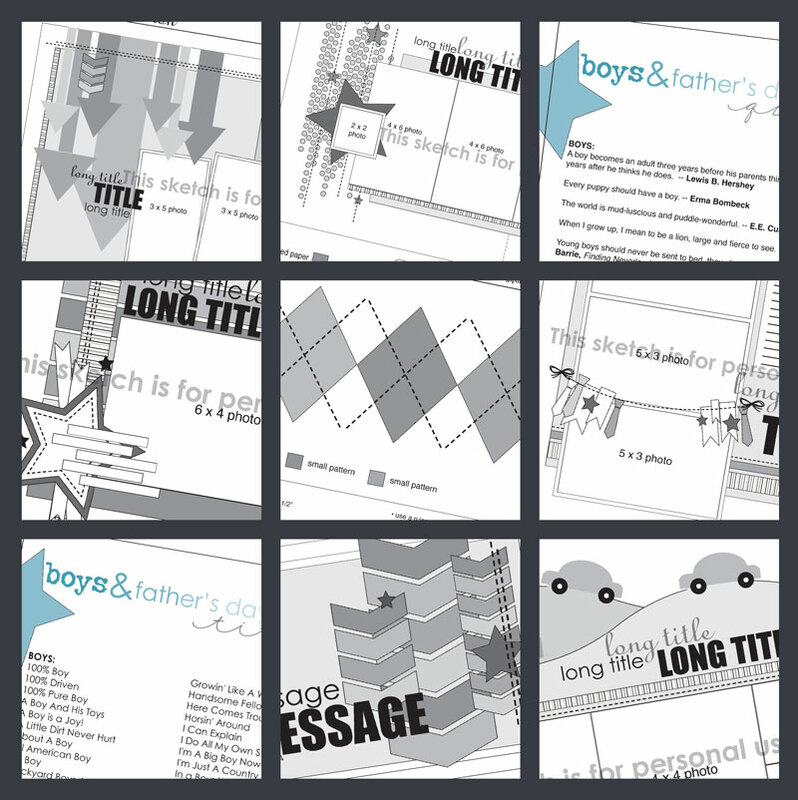 SCRAPBOOK GENERATION: Go grab your free download sketch for June! If it's Tuesday, it's download day! In addition to products ranging from single sketches to another great themed bundle of goodies by Allison Davis, we're also releasing two cardmaking sketch books. 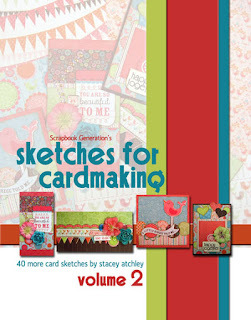 We're excited to offer both volumes of Sketches for Cardmaking by Stacey Atchley as downloadable e-books. Each volume of Sketches for Cardmaking features 40 card sketches, complete with measurements of all elements and suggestions on how to vary the size and look of each card. With the addition of these to our e-book selection, all print books published by SG are now available to download to your computer or tablet! Four new two-page sketches designed by Allison Davis that all feature 6 photos. The first sketch features six 3-1/2 x 5 photos with several horizontal strips, large journaling space and heart accents. The second sketch has three 2-1/2 x 2-1/2 photos, one 7 x 5 photo, one 4 x 4 photo, and one 3 x 4 photo and has a large background, vertical strips and is accented with stars and stitching. The third sketch has six 4 x 4 photos with several vertical strips, a banner, and accented with stars. The fourth sketch has four 4 x 3 photos and two 4 x 6 photos with a large background, banner pieces, and is accented with hearts and a camera. Three two-page sketches from a popular Allison Davis class held at a Scrapbook Generation event. The first sketch has two 3 x 3 photos, one 3 x 2 photo, six 2 x 2" photos, one 6 x 4" photo, one 4 x 4" photo, and one 4 x6" photo with lots of vertical strips behind a title block and journaling block. The second sketch has five 3 x 4 photos and two 6 x 4 photos with several vertical strips, a large title block and accented with arrows. The third sketch has five 3 x 3 photos, one 4 x 6 photo, one 3 x 4 photo, and one 6 x 4 photo with lots of banner pieces. A one-page sketch designed by Allison Davis, perfect for use with 6 x 6 paper pads. The sketch has three 2-1/2 x 3-1/2 photos with one 6 x 6 square with 6 strips for the background and is accented with hearts. A two-page sketch designed by Allison Davis. 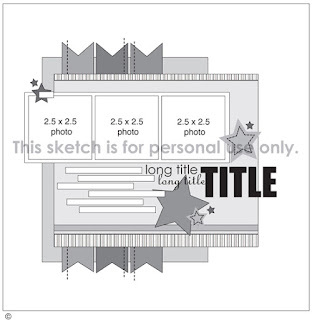 There are two 3 x 5 photos, two 6 x 4 photos, and one 4 x 2 photo with squares, large title block and large journaling block accented with stars. 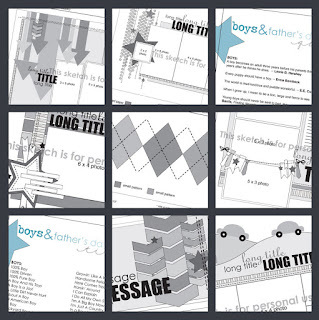 • Includes: 6 two-page boy-themed sketches, 6 one-page boy-themed sketches, 4 boy-themed cards, 5 boy embellishment ideas/sketches, boy/father titles, and boy/father quotes. Click here to go to SG's online store where you can download this one-page sketch by Allison Davis!